In 2001, Hellboy quit the B.P.R.D., leaving Abe Sapien to lead Liz Sherman and a bizarre roster of special agents in defending the world from occult threats, including the growing menace of the frog army first spotted in Hellboy: Seed of Destruction. 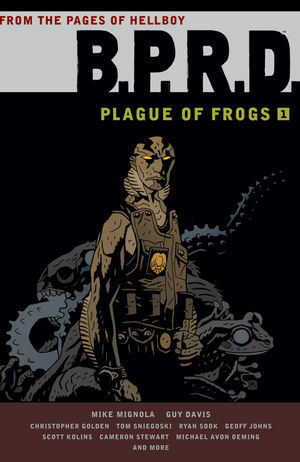 Mike Mignola and Dark Horse present the complete Plague of Frogs saga, from Hollow Earth to The King of Fear. This second volume dives deeper into Abe's origin story, introduces the reader to Bureau villains Memnan Saa and the Black Flame, and features the first appearance of fan-favorite Daimio! This volume collects B.P.R.D. : The Dead, B.P.R.D. : The Black Flame, and B.P.R.D. : War on Frogs. Collects three trade paperbacks into one value-priced hardcover collection!